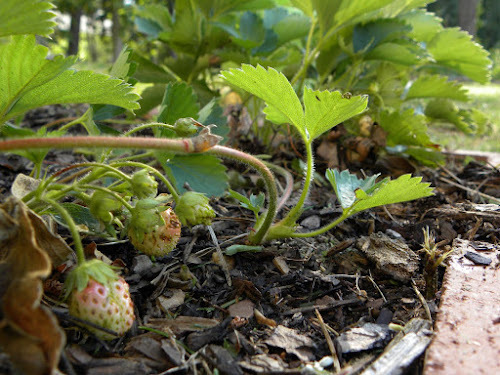 Last Spring I purchased about 9 Quinault everbearing strawberry crowns, planted them in the back gardens and then moved them beside the deck at the end of the summer so we could till up the back. As with just about everything I garden, I knew nothing about strawberries when I started growing them, so I've been learning as I go. Over the past week or two, I've been pretty excited that my strawberries are generating runners - meaning I will be getting new daughter plants. Each runner is forming two new crowns that can be pruned from the main plant and relocated once rooted. I've noticed two problems during this new phase. First, my new wave of strawberries are tiny. Unfortunately, everbearing strawberries aren't supposed to produce many runners, and these should be pruned to preserve as many nutrients for the fruit as it develops. Whoops. I'm a little late on the pruning, so this year I'm going to just allow the runners to do their thing. 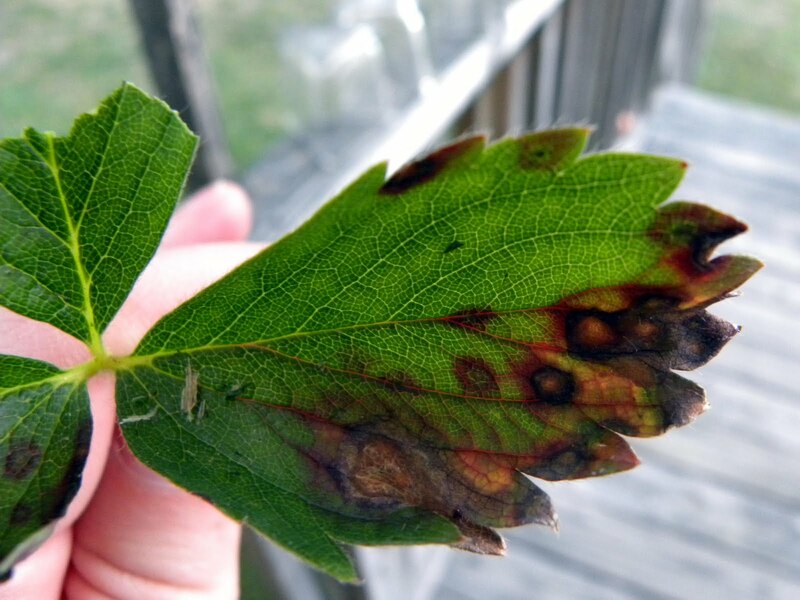 The second problem is that the older leaves on my plants are getting brown spots that eventually spread and cause the leaves to die. 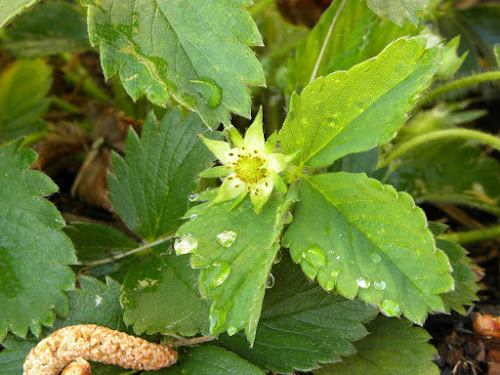 Comparing these spots to pictures provided by online resources, I know I have a type of fungus, and I think I've narrowed it down to strawberry leaf blight. Leaf scorch and blotch are other possibilities. "Leaf blight (Dendrophoma obscurans) occurs on older strawberry leaves, and is more severe on red stele resistant cultivars. Spots are large, 1/2-1 inch in diameter, circular to oval in shape. Young spots are reddish-purple, enlarge with age and develop a brown center bordered by a purple zone. Small black fungal fruiting structures may be observed in the center of the spot. Lesions may also develop on runners of susceptible cultivars. This disease has been common for several years on red stele resistant cultivars." Other online sources encouraged removal of infected and old leaves (water can splash off the diseased leafs and spread the fungus to new leaves), so yesterday evening I spent some time pruning and attempting to clean out the old leaf debris that was likely holding in extra moisture and preventing good air circulation which can lead to the spread of diseases. These plants are supposed to have 18" spacing, and it appears that some of my crowns have already multiplied (sneaky little things) causing the bed to already be over crowded. This fall I will be thinning the bed! Wow- good info. Good luck getting rid of the fungus. Hope all is well with your runners, and the new spacing and clearing out of old leaves leads to healthy plants! Interestingly enough, my word verification for this comment was "rotling".